Mother Church also rejoices in noting that throughout history the Lord has continued to reveal himself to the little and the humble, enabling his chosen ones, through the Spirit who "searches everything, even the depths of God" (1 Cor 2:10), to speak of the gifts "bestowed on us by God... in words not taught by human wisdom but taught by the Spirit, interpreting spiritual truths in spiritual language" (1 Cor 2:12,13). In this way the Holy Spirit guides the Church into the whole truth, endowing her with various gifts, adorning her with his fruits, rejuvenating her with the power of the Gospel and enabling her to discern the signs of the times in order to respond ever more fully to the will of God (cf. Lumen gentium, nn. 4, 12; Gaudium et spes, n. 4). During her life Thérèse discovered "new lights, hidden and mysterious meanings" (Ms A, 83v) and received from the divine Teacher that "science of love" which she then expressed with particular originality in her writings (cf. Ms B, 1r). This science is the luminous expression of her knowledge of the mystery of the kingdom and of her personal experience of grace. It can be considered a special charism of Gospel wisdom which Thérèse, like other saints and teachers of faith, attained in prayer (cf. Ms C, 36r·). 2. The reception given to the example of her life and Gospel teaching in our century was quick, universal and constant. As if in imitation of her precocious spiritual maturity, her holiness was recognized by the Church in the space of a few years. In fact, on 10 June 1914 Pius X signed the decree introducing her cause of beatification; on 14 August 1921 Benedict XV declared the heroic virtues of the Servant of God, giving an address for the occasion on the way of spiritual childhood; and Pius XI proclaimed her blessed on 29 April 1923. Shortly afterwards, on 17 May 1925, the same Pope canonized her before an immense crowd in St Peter's Basilica, highlighting the splendour of her virtues and the originality of her doctrine. Two years later, on 14 December 1927, in response to the petition of many missionary Bishops, he proclaimed her patron of the missions along with St Francis Xavier. Beginning with these acts of recognition, the spiritual radiance of Thérèse of the Child Jesus increased in the Church and spread throughout the world. Many institutes of consecrated life and ecclesial movements, especially in the young Churches, chose her as their patron and teacher, taking their inspiration from her spiritual doctrine. Her message, often summarized in the so-called "little way", which is nothing other that the Gospel way of holiness for all, was studied by theologians and experts in spirituality. Cathedrals, basilicas, shrines and churches throughout the world were built and dedicated to the Lord under the patronage of the Saint of Lisieux. The Catholic Church venerates her in the various Eastern and Western rites. Many of the faithful have been able to experience the power of her intercession. Many of those called to the priestly ministry or the consecrated life, especially in the missions and the cloister, attribute the divine grace of their vocation to her intercession and example. This spiritual doctrine has been passed on to us primarily by her autobiography which, taken from three manuscripts she wrote in the last years of her life and published a year after her death with the title Histoire d'une âme (Lisieux 1898), has aroused an extraordinary interest down to our day. This autobiography, translated along with her other writings into about 50 languages, has made Thérèse known in every part of the world, even outside the Catholic Church. A century after her death, Thérèse of the Child Jesus continues to be recognized as one of the great masters of the spiritual life in our time. 5. In this context I am pleased to recall briefly some events in the life of Thérèse of the Child Jesus. Born in Alençon, France, on 2 January 1873, she is baptized two days later in the Church of Notre Dame, receiving the name Marie-Françoise-Thérèse. Her parents are Louis Martin and Zélie Guérin, whose heroic virtues I recently recognized. After her mother's death on 28 August 1877, Thérèse moves with her whole family to the town of Lisieux where, surrounded by the affection of her father and sisters, she receives a formation both demanding and full of tenderness. Towards the end of 1879 she receives the sacrament of Penance for the first time. On the day of Pentecost in 1883 she has the extraordinary grace of being healed from a serious illness through the intercession of Our Lady of Victories. Educated by the Benedictines of Lisieux, she receives First Communion on 8 May 1884, after an intense preparation crowned with an exceptional experience of the grace of intimate union with Jesus. A few weeks later, on 14 June of that same year, she receives the sacrament of Confirmation with a vivid awareness of what the gift of the Holy Spirit involves in her personal sharing in the grace of Pentecost. On Christmas Day of 1886 she has a profound spiritual experience that she describes as a "complete conversion". As a result, she overcomes the emotional weakness caused by the loss of her mother and begins "to run as a giant" on the way of perfection (cf. Ms A, 44v45v). On 9 April 1888 she enters the Carmel of Lisieux, where she receives the habit of the Blessed Virgin's order on 10 January of the following year and makes her religious profession on 8 September 1890, the feast of the Birth of the Virgin Mary. At Carmel she undertakes the way of perfection marked out by the Mother Foundress, Teresa of Jesus, with genuine fervour and fidelity in fulfilling the various community tasks entrusted to her. Illumined by the Word of God, particularly tried by the illness of her beloved father, Louis Martin, who dies on 29 July 1894, Thérèse embarks on the way of holiness, insisting on the centrality of love. She discovers and imparts to the novices entrusted to her care the little way of spiritual childhood, by which she enters more and more deeply into the mystery of the Church and, drawn by the love of Christ, feels growing within her the apostolic and missionary vocation which spurs her to bring everyone with her to meet the divine Spouse. On 9 June 1895, the feast of the Most Holy Trinity, she offers herself as a sacrificial victim to the merciful Love of God. On 3 April of the following year, on the night between Holy Thursday and Good Friday, she notices the first symptoms of the illness which will lead to her death. Thérèse welcomes it as a mysterious visitation of the divine Spouse. At the same time she undergoes a trial of faith which will last until her death. As her health deteriorates, she is moved to the infirmary on 8 July 1897. Her sisters and other religious collect her sayings, while her sufferings and trials, borne with patience, intensify to the moment of her death on the afternoon of 30 September 1897. "I am not dying; I am entering life", she had written to one of her spiritual brothers, Fr Bellière (Lettres 244). Her last words, "My God, I love you", are the seal of her life. 6. Thérèse of the Child Jesus left us writings that deservedly qualify her as a teacher of the spiritual life. Her principal work remains the account of her life in three autobiographical manuscripts (Manuscrits autobiographiques A, B, C), first published with the soon to be famous title of Histoire d'une Âme. Manuscript C, composed in June and the first days of July 1897, a few months before her death and dedicated to the Prioress, Marie de Gonzague, who had requested it, completes the recollections in Manuscript A on life in Carmel. These pages reveal the author's supernatural wisdom. Thérèse recounts some sublime experiences during this final period of her life. She devotes moving pages to her trial of faith: a grace of purification that immerses her in a long and painful dark night, illuminated by her trust in the merciful, fatherly love of God. Once again, and without repeating herself, Thérèse makes the light of the Gospel shine brightly. Here we find the most beautiful pages she devoted to trusting abandonment into God's hands, to unity between love of God and love of neighbour, to her missionary vocation in the Church. In these three different manuscripts, which converge in a thematic unity and in a progressive description of her life and spiritual way, Thérèse has left us an original autobiography which is the story of her soul. It shows how in her life God has offered the world a precise message, indicating an evangelical way, the "little way", which everyone can take, because everyone is called to holiness. In the 266 Lettres we possess, addressed to family members, women religious and missionary "brothers", Thérèse shares her wisdom, developing a teaching that is actually a profound exercise in the spiritual direction of souls. Her writings also include 54 Poésies, some of which have great theological and spiritual depth inspired by Sacred Scripture. Worthy of special mention are Vivre d'Amour!... (Poésies 17) and Pourquoi je t'aime, ô Marie! (Poésies 54), an original synthesis of the Virgin Mary's journey according to the Gospel. To this literary production should be added eight Récréations pieuses: poetic and theatrical compositions, conceived and performed by the Saint for her community on certain feast days, in accordance with the tradition of Carmel. Among those writings should be mentioned a series of 21 Prières. Nor can we forget the collection of all she said during the last months of her life. These sayings, of which there are several editions, known as the Novissima verba, have also been given the title Derniers Entretiens. 7. From careful study of the writings of St Thérèse of the Child Jesus and from the resonance they have had in the Church, salient aspects can be noted of her "eminent doctrine", which is the fundamental element for conferring the title of Doctor of the Church. Pius XI, who considered Thérèse of Lisieux the "Star of his pontificate", did not hesitate to assert in his homily on the day of her canonization, 17 May 1925: "The Spirit of truth opened and made known to her what he usually hides from the wise and prudent and reveals to little ones; thus she enjoyed such knowledge of the things above - as Our immediate Predecessor attests - that she shows everyone else the sure way of salvation" (AAS 17 , p. 213). Her teaching not only conforms to Scripture and the Catholic faith, but excels ("eminet") for the depth and wise synthesis it achieved. Her doctrine is at once a confession of the Church's faith, an experience of the Christian mystery and a way to holiness. Thérèse offers a mature synthesis of Christian spirituality: she combines theology and the spiritual life; she expresses herself with strength and authority, with a great ability to persuade and communicate, as is shown by the reception and dissemination of her message among the People of God. Thérèse's teaching expresses with coherence and harmonious unity the dogmas of the Christian faith as a doctrine of truth and an experience of life. In this regard it should not be forgotten that the understanding of the deposit of faith transmitted by the Apostles, as the Second Vatican Council teaches, makes progress in the Church with the help of the Holy Spirit: "There is growth in insight into the realities and words that are passed on... through the contemplation and study of believers who ponder these things in their hearts (cf. Lk 2:19 and 51). It comes from the intimate sense of spiritual realities which they experience. And it comes from the preaching of those who have received, along with their right of succession in the episcopate, the sure charism of truth" (Dei Verbum, n. 8). 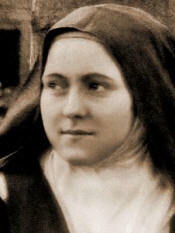 In the writings of Thérèse of Lisieux we do not find perhaps, as in other Doctors, a scholarly presentation of the things of God, but we can discern an enlightened witness of faith which, while accepting with trusting love God's merciful condescension and salvation in Christ, reveals the mystery and holiness of the Church. We can apply to Thérèse of Lisieux what my Predecessor Paul VI said of another young Saint and Doctor of the Church, Catherine of Siena: "What strikes us most about the Saint is her infused wisdom, that is to say, her lucid, profound and inebriating absorption of the divine truths and mysteries of faith.... That assimilation was certainly favoured by the most singular natural gifts, but it was also evidently something prodigious, due to a charism of wisdom from the Holy Spirit" (AAS 62 , p. 675). 8. With her distinctive doctrine and unmistakable style, Thérèse appears as an authentic teacher of faith and the Christian life. In her writings, as in the sayings of the Holy Fathers, is found that life-giving presence of Catholic tradition whose riches, as the Second Vatican Council again says, "are poured out in the practice and life of the Church, in her belief and prayer" (Dei Verbum, n. 8). If considered in its literary genre, corresponding to her education and culture, and if evaluated according to the particular circumstances of her era, the doctrine of Thérèse of Lisieux appears in providential harmony with the Church's most authentic tradition, both for its confession of the Catholic faith and for its promotion of the most genuine spiritual life, presented to all the faithful in a living, accessible language. She has made the Gospel shine appealingly in our time; she had the mission of making the Church, the Mystical Body of Christ, known and loved; she helped to heal souls of the rigours and fears of Jansenism, which tended to stress God's justice rather than his divine mercy. In God's mercy she contemplated and adored all the divine perfections, because "even his justice (and perhaps even more so than the other perfections) seems to me clothed in love" (Ms A, 83v·). Thus she became a living icon of that God who, according to the Church's prayer, "shows his almighty power in his mercy and forgiveness" (cf. Roman Missal, Opening prayer, 26th Sunday in Ordinary Time). The core of her message is actually the mystery itself of God-Love, of the Triune God, infinitely perfect in himself. If genuine Christian spiritual experience should conform to the revealed truths in which God communicates himself and the mystery of his will (cf. Dei Verbum, n. 2), it must be said that Thérèse experienced divine revelation, going so far as to contemplate the fundamental truths of our faith united in the mystery of Trinitarian life. At the summit, as the source and goal, is the merciful love of the three Divine Persons, as she expresses it, especially in her Act of Oblation to Merciful Love. At the root, on the subject's part, is the experience of being the Father's adoptive children in Jesus; this is the most authentic meaning of spiritual childhood, that is, the experience of divine filiation, under the movement of the Holy Spirit. At the root again, and standing before us, is our neighbour, others, for whose salvation we must collaborate with and in Jesus, with the same merciful love as his. As it was for the Church's Saints in every age, so also for her, in her spiritual experience Christ is the centre and fullness of Revelation. Thérèse knew Jesus, loved him and made him loved with the passion of a bride. She penetrated the mysteries of his infancy, the words of his Gospel, the passion of the suffering Servant engraved on his holy Face, in the splendour of his glorious life, in his Eucharistic presence. She sang of all the expressions of Christ's divine charity, as they are presented in the Gospel (cf. PN 24, Jésus, mon Bien-Aimé, rappelle-toi!). Thérèse received particular light on the reality of Christ's Mystical Body, on the variety of its charisms, gifts of the Holy Spirit, on the eminent power of love, which in a way is the very heart of the Church, where she found her vocation as a contemplative and missionary (cf. Ms B, 2r·-3v·). Lastly, among the most original chapters of her spiritual doctrine we must recall Thérèse's wise delving into the mystery and journey of the Virgin Mary, achieving results very close to the doctrine of the Second Vatican Council in chapter eight of the Constitution Lumen gentium and to what I myself taught in the Encyclical Letter Redemptoris Mater of 25 March 1987. Despite her inadequate training and lack of resources for studying and interpreting the sacred books, Thérèse immersed herself in meditation on the Word of God with exceptional faith and spontaneity. Under the influence of the Holy Spirit she attained a profound knowledged of Revelation for herself and for others. By her loving concentration on Scripture - she even wanted to learn Hebrew and Greek to understand better the spirit and letter of the sacred books - she showed the importance of the biblical sources in the spiritual life, she emphasized the originality and freshness of the Gospel, she cultivated with moderation the spiritual exegesis of the Word of God in both the Old and New Testaments. Thus she discovered hidden treasures, appropriating words and episodes, sometimes with supernatural boldness, as when, in reading the texts of St Paul (cf. 1 Cor 12-13), she realized her vocation to love (cf. Ms B, 3r-3v). Enlightened by the revealed Word, Thérèse wrote brilliant pages on the unity between love of God and love of neighbour (cf. Ms C, 11v-19r); and she identified with Jesus' prayer at the Last Supper as the expression of her intercession for the salvation of all (cf. Ms C, 34r-35r). In addition to the words of Scripture and the Church's doctrine, Thérèse was nourished as a youth by the teaching of the Imitation of Christ, which, as she herself acknowledges, she knew almost by heart (cf. Ms A, 47r). Decisive for fulfilling her Carmelite vocation were the spiritual texts of the Mother Foundress, Teresa of Jesus, especially those explaining the contemplative and ecclesial meaning of the charism of the Teresian Carmel (cf. Ms C, 33v). But in a very special way, Thérèse was nourished on the mystical doctrine of St John of the Cross, who was her true spiritual master (cf. Ms A, 83r). It should cause no surprise, then, if she who had been an outstanding pupil in the school of these two Saints, later declared Doctors of the Church, should later become a master of the spiritual life. 10. The spiritual doctrine of Thérèse of Lisieux has helped extend the kingdom of God. By her example of holiness, of perfect fidelity to Mother Church, of full communion with the See of Peter, as well as by the special graces obtained by her for many missionary brothers and sisters, she has rendered a particular service to the renewed proclamation and experience of Christ's Gospel and to the extension of the Catholic faith in every nation on earth. There is no need to dwell at length on the universality of Thérèse's doctrine and on the broad reception of her message during the century since her death: it has been well documented in the studies made in view of conferring on her the title of Doctor of the Church. A particularly important fact in this regard is that the Church's Magisterium has not only recognized Thérèse's holiness, but has also highlighted the wisdom of her doctrine. Pius X had already said that she was "the greatest saint of modern times". On joyfully receiving the first Italian edition of the Story of a Soul, he extolled the fruits that had resulted from Thérèse's spirituality. Benedict XV, on the occasion of proclaiming the Servant of God's heroic virtues, explained the way of spiritual childhood and praised the knowledge of divine realities which God granted to Thérèse in order to teach others the ways of salvation (cf. AAS 13 , pp. 449-452). On the occasion of both her beatification and canonization, Pius XI wished to expound and recommend the Saint's doctrine, underscoring her special divine enlightenment (Discorsi di Pio XI, vol. I, Turin 1959, p. 91) and describing her as a teacher of life (cf. AAS 17 , pp. 211-214). When the Basilica of Lisieux was consecrated in 1954, Pius XII said, among other things, that Thérèse penetrated to the very heart of the Gospel with her doctrine (cf. AAS 46 , pp. 404-408). Cardinal Angelo Roncalli, the future Pope John XXIII, visited Lisieux several times, especially when he was Nuncio in Paris. On various occasions during his pontificate he showed his devotion to the Saint and explained the relationship between the doctrine of the Saint of Avila and her daughter, Thérèse of Lisieux (Discorsi, Messaggi, Colloqui, vol. II [1959-1960], pp. 771-772). Many times during the celebration of the Second Vatican Council, the Fathers recalled her example and doctrine. On the centenary of her birth, Paul VI addressed a Letter on 2 January 1973 to the Bishop of Bayeux and Lisieux, in which he extolled Thérèse's example in the search for God, offered her as a teacher of prayer and theological virtue of hope, and a model of communion with the Church, calling the attention of teachers, educators, pastors and theologians themselves to the study of her doctrine (cf. AAS 65 , pp. 12-15). I myself on various occasions have had the joy of recalling the person and doctrine of the Saint, especially during my unforgettable visit to Lisieux on 2 June 1980, when I wished to remind everyone: "One can say with conviction about Thérèse of Lisieux that the Spirit of God allowed her heart to reveal directly to the people of our time the fundamental mystery, the reality of the Gospel.... Her 'little way' is the way of 'holy childhood'. There is something unique in this way, the genius of St Thérèse of Lisieux. At the same time there is the confirmation and renewal of the most basic and most universal truth. What truth of the Gospel message is really more basic and more universal than this: God is our Father and we are his children?" (Insegnamenti di Giovanni Paolo II, vol. III/1 , p. 1659). Thérèse possesses an exceptional universality. Her person, the Gospel message of the "little way" of trust and spiritual childhood have received and continue to receive a remarkable welcome, which has transcended every border. The influence of her message extends first of all to men and women whose holiness and heroic virtues the Church herself has recognized, to the Church's pastors, to experts in theology and spirituality, to priests and seminarians, to men and women religious, to ecclesial movements and new communities, to men and women of every condition and every continent. To everyone Thérèse gives her personal confirmation that the Christian mystery, whose witness and apostle she became by making herself in prayer "the apostle of the apostles", as she boldly calls herself (Ms A, 56r·), must be taken literally, with the greatest possible realism, because it has a value for every time and place. The power of her message lies in its concrete explanation of how all Jesus' promises are fulfilled in the believer who knows how confidently to welcome in his own life the saving presence of the Redeemer. Thérèse is also a contemplative. In the hiddenness of her Carmel she lived the great adventure of Christian experience to the point of knowing the breadth, length, height and depth of Christ's love (cf. Eph 3:18-19). God did not want his secrets to remain hidden, but enabled Thérèse to proclaim the secrets of the King (cf. Ms C, 2v·). By her life Thérèse offers a witness and theological illustration of the beauty of the contemplative life as the total dedication to Christ, Spouse of the Church, and as an affirmation of God's primacy over all things. Hers is a hidden life which possesses a mysterious fruitfulness for spreading the Gospel and fills the Church and the world with the sweet odour of Christ (cf. LT 169, 2v). 12. This year, when the centenary of the glorious death of Thérèse of the Child Jesus and the Holy Face is being celebrated, as we prepare to celebrate the Great Jubilee of the Year 2000, after receiving a great number of authoritative petitions, especially from many Episcopal Conferences throughout the world, and after accepting the official petition, or Supplex Libellus, addressed to me on 8 March 1997 by the Bishop of Bayeux and Lisieux, as well as from the Superior General of the Discalced Carmelites of the Blessed Virgin Mary of Mount Carmel and from the Postulator General of the same order, I decided to entrust the Congregation for the Causes of Saints, which has competence in this matter, with the special study of the cause for conferring the title of Doctor on this Saint, "after hearing the opinion of the Congregation for the Doctrine of the Faith regarding the eminent doctrine" (Apost. Const. Pastor Bonus, n. 73). After the necessary documentation had been collected, the two above-mentioned Congregations addressed the question in the meetings of their respective consultors: the Congregation for the Doctrine of the Faith on 5 May 1997, with regard to the "eminent doctrine", and the Congregation for the Causes of Saints on 29 May of the same year, to examine the special "Positio". On the following 17 June, the Cardinals and Bishops who are members of these Congregations, following a procedure approved by me for this occasion, met in a plenary interdicasterial session and discussed the cause, giving a unanimously favourable opinion on granting the title of Doctor of the Universal Church to St Thérèse of the Child Jesus and the Holy Face. I was personally informed of this opinion by Cardinal Joseph Ratzinger, Prefect of the Congregation for the Doctrine of the Faith, and by the Pro-Prefect of the Congregation for the Causes of Saints, Archbishop Alberto Bovone, titular Archbishop of Caesarea in Numidia. Today, 19 October 1997, in St Peter's Square, filled with faithful from every part of the world, and in the presence of a great many Cardinals, Archbishops and Bishops, during the solemn Eucharistic celebration I proclaimed Thérèse of the Child Jesus and the Holy Face a Doctor of the Universal Church in these words: Fulfilling the wishes of many Brothers in the Episcopate and of a great number of the faithful throughout the world, after consulting the Congregation for the Causes of Saints and hearing the opinion of the Congregation for the Doctrine of the Faith regarding her eminent doctrine, with certain knowledge and after lengthy reflection, with the fullness of Our apostolic authority We declare Saint Thérèse of the Child Jesus and the Holy Face, virgin, to be a Doctor of the Universal Church. In the name of the Father, and of the Son and of the Holy Spirit.